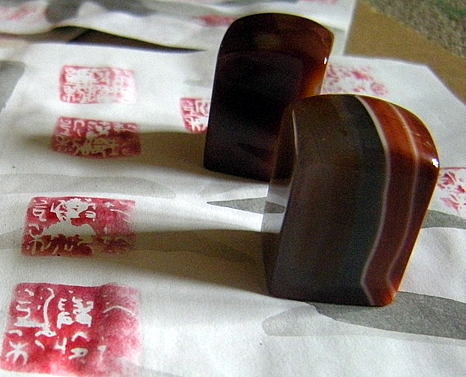 Since I do my own Chinese ink brush painting, calligraphy, & watercolor, I needed a Chinese chop stone, or Chinese chop seal if you will, to sign my artwork with. 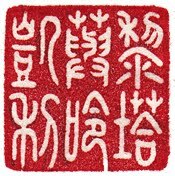 I spent several days browsing around online for the best deals on Chinese seal carving, and I found the best price online for buying custom carved Chinese seals, direct from a carver in China. 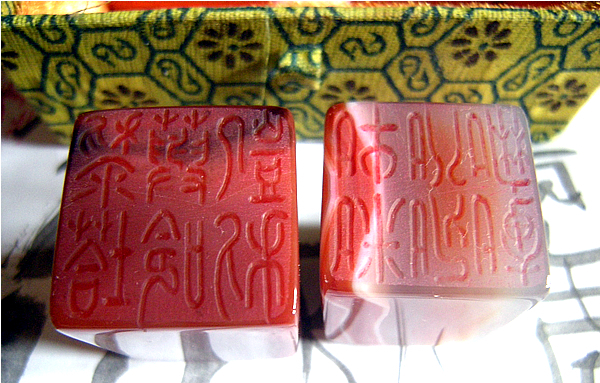 Many online retailers and other online vendors specializing in art supplies to the Asian painting market have very inflated prices and charge anywhere from $50 to over $100 for a blank chop stone, and then they charge you an additional astronomical fee for the seal carving. Worst part is, many online retailers are just middlemen acting as resellers. You order your Chinese name seal from them at $100+, then they order from the carver at a mere fraction of what they're charging you. Well, you can skip the middleman and order direct from a carver. I have seen some seal carvers charging some insane amounts of money and as much as I really needed Chinese chop seals to stamp my paintings with, I wanted them as cheap as possible, but also to be a high quality product with excellent craftsmanship, and I'm happy that I have found just that, from a seal carver named Feng Zhuo in Qufu, Shangdong Province, China.. Qufu is the hometown and birthplace of Confucius. I'm very happy with my order. I contacted Feng Zhuo via his eBay shop and inquired about which size I needed for my name and received an immediate response. 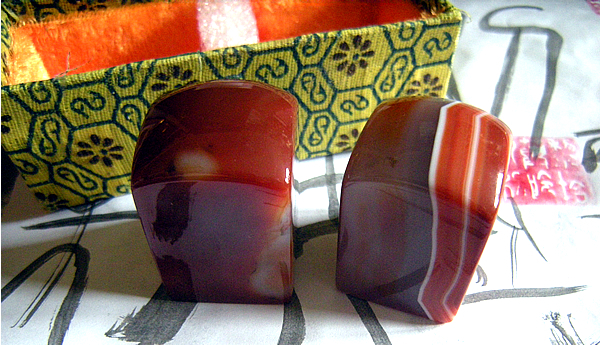 I browsed around his online shop, chose my stones, and ordered two Chinese chop stone seals for $16 + $9 shipping to the US, with no additional charge for the carving. A day later, Mr. Zhuo showed me a photograph of the seal's imprint, which is what you see in the upper right hand corner of this blog, which is the seal for my name, carved in Chinese seal script. I was satisfied with the results and Mr. Zhuo prepared my package for shipping, which only took 8 days to arrive from China to the East coast United States..
Feng Zhuo, who operates under the business name of Zhuo Yuan Seal Co. LTD aka Ideas For Life on eBay, is an award winning seal carver and engraver with over 10 years experience. His service is superb, as well as the quality of his craftsmanship and materials. 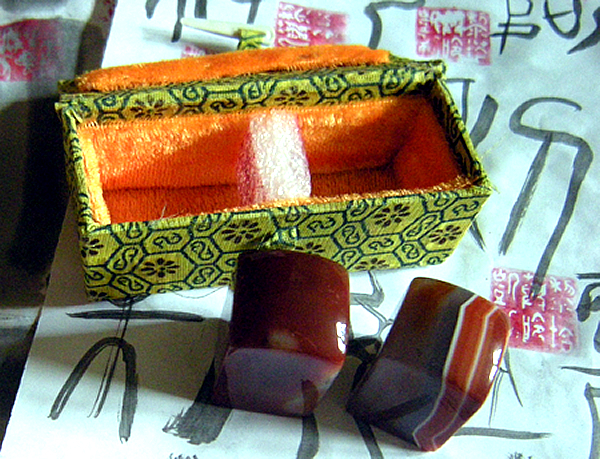 I highly recommend him if you need Chinese chop stone seals carved with your name, etc. 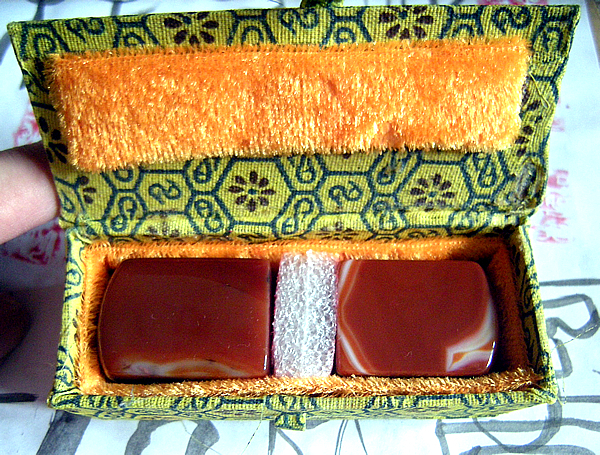 My Chinese chop stones arrived well packed for safe travel from China to the US, with their own traditional Chinese storage case. The Chinese chop seals I ordered are Baiwen, also referred to as Yin Seals, which is white characters on red background, but you may also request Chinese seal carving for Zhuwen, aka Yang Seals, which is red characters on white background, which is what I'll be ordering next. Unfortunately I didn't order any Chop seal paste yet, aka Yinni, or Cinnabar ink, so I am not able to show you the results of the seal inked on paper, other than the sample provided to me by Mr Zhuo. I did however experiment by attempting to make my own mock seal paste using a thick mix of Vermillion watercolor since I just couldn't resist the temptation to try it. :) Not too bad considering its lack of pastiness, so I can't wait til I get a Cinnabar ink tin. In retrospect, I should have ordered any of the sets of Chinese chops that Feng Zhuo sells that include the Cinnabar ink paste. If you order Chinese Chop Seals from Mr Zhuo, please tell him that I sent you, with high recommendations. Who knows, maybe I'll get a discount in the future, lol.. but more importantly, I think he deserves the recognition and more business than the high priced sharks out there.